When the Chinese occupied the Paracel Islands in early 1974, the absence of official reaction drew the attention of the French embassy in New Delhi. A diplomat went to interview the Head of the China desk at South Block, the Indian ministry of External Affairs. The senior officer analyzed that “the occupation by force of the Paracel Islands must be interpreted as a warning sign of Beijing’s Southern seas strategy aiming at encircling Southeast Asia and at exercising a dominant influence over the region, economically, politically and strategically”. Besides Beijing was asserting claims to the Spratley Islands and adjacent territorial waters, not ruling out the use of armed force if necessary. In view of their rapprochement with the People’s Republic of China and obsessed with the containment of the Soviet Union, the United States were seen as complacent, willing to allow some kind of Chinese influence in the Indian Ocean, extending up to the Eastern coast of Africa (telegram from the Ambassador of France in New Delhi to the Minister of Foreign Affairs, 11 February 1974. French Diplomatic Archives, Asie-Océanie, Chine, 1973-1980, 752 INVA/2138). Almost a half century has passed and China’s harbored oceanic ambitions are more tangible than ever as reflected by its first overseas military base in Djibouti. The reshuffling of Cold War’s alignments has altered the strategic setting and India’s strategic outreach and economic liberalization has opened new vistas and commitments spilling over the maritime domain where New Delhi is ineluctably compelled to face China’s Belt and Road initiative. The Indian Navy, a force to reckon with in the Indian Ocean Region? In April 1989, enticed by the acquisition of an old ­British aircraft carrier (HMS Hermes/INS Viraat) and the lease of a Soviet K-43 nuclear-powered submarine (INS Chakra), the Asia edition of Time magazine in a cover story titled “Superpower rising” highlighted the blue-water ambitions of the Indian Navy as a manifestation of a resurgent India propelled by an arms buildup. New Delhi had few months before put down militarily a coup attempt in the Maldives which won applause from Ronald Reagan for a “valuable contribution to regional stability”. In July 1987, New Delhi had forced an agreement on the Sri Lanka government providing for the deployment of Indian troops in the north and east of the island to quell the Tamil separatist guerilla. In an attached exchange of letters, it was said that Sri Lanka will not allow any activities on its territory detrimental to India’s security, including making ports available for military use by any country in a manner prejudicial to India’s interests. Richard Armitage, then Assistant Secretary of State for East Asian and Pacific Affairs, noted prophetically that it didn’t “make sense for the U.S. not to have a congenial relationship with the largest democracy and the dominant military power in the subcontinent – and with a country that will clearly take its place on the world stage in the 21st century.”Time, April 3, 1989, p. 7. The rise of the Indian Navy was nevertheless then in its infancy. The Indian Maritime Doctrine of 2015 emphasizes the necessity to manifest a strong presence of the Navy in the Indian Ocean Region (IOR), to strengthen the coastal defense, and to display a resolve to protect sea lanes of communications. This objective implies an ambitious program to build up capacity within the « Make in India » framework relying on local shipbuilding facilities and pushing for an indigenization process still far from complete, particularly in the realm of propulsion systems. The Maritime Capability Perspective Plan 2027 sets out the goal of 212 warships and 458 naval aircraft, compared to only 138 warships and 235 aircraft in 2017, to become a powerful three-dimensional blue-water force capable of effectively guarding India’s expanding geo-strategic interests and securing its commercial exchanges in an ever-increasing dependence on the outside world for economic development. To reach those figures, a modernization plan aiming at improving the existing infrastructure, expanding the production capacity and integrating the latest naval architecture has been initiated in the public shipyards. In addition, a military shipbuilding industry in the private sector is slowly coming of age. In February 2017, Reliance Defence and Engineering Limited entered into a “Master Ship Repair Agreement” for servicing of U.S. Navy’s 7th Fleet’s ships at the company’s Pipavav (Gujarat) shipyard, a fall out of the Logistics Exchange Memorandum of Agreement (LEMOA) signed between India and the United States in August 2016 giving access to both countries to designated military facilities on either side for the purpose of re-fuelling and replenishment. More than 40 warships and submarines are on order or under construction. On top of the list is the long-stated –but distant - objective of possessing three aircraft carriers, with the purpose of embracing at any given time the eastern and western flanks of the Indian Ocean. As of today, the Indian Navy has only INS Vikramadatiya (the refurbished Admiral Gorshkov bought from the Russians) commissioned in 2013 and notably equipped with MiG-29K. The 40,000 tons INS Vikrant, the second indigenous aircraft carrier (IAC) and the first built in India at the Kochi shipyard, is expected to be commissioned by end 2020 and to become fully operational, with its aviation complex, again mainly Russian, and long-range surface-to-air missiles, in 2023 at the earliest. The 65,000 tons IAC-II remains looked in politico-bureaucratic tangle and the Navy has ditched its ambition of having nuclear-propulsion. IAC-II would have CATOBAR (Catapult Assisted Take-Off But Arrested Recovery) configuration to launch from its deck fighters as well as heavier aircraft for surveillance, early-warning and electronic warfare. Till now, India operates carriers with angled ski-jumps for fighters taking off under their own power in STOBAR (Short Take-Off But Arrested Recovery) setting. Part and parcel of the nuclear triad covering land-air-sea modes, and the most dependable platform for a second-strike, given the country “no first use” on nuclear weapons, India’s only ship submersible ballistic nuclear (SSBN) asset, INS Arihant, has been commissioned in August 2016 but its induction is still not officially acknowledged. Thirty years in the making, adjusting a Russian-supplied design with indigenous fabrication has not gone without its share of problems and over-cost. A second SSBN, INS Arighat, was launched on November 2017. The plan is to to build three additional Arihant-class vessels. In the meantime, the ten year lease of the Russian Akula-II class nuclear attack submarine signed in 2011 will have expired. The six Scorpene-class submarines built at Mazagon Dock Shipbuilders with the expertise of Naval Group (the third one has been launched in January 2018) are a significant addition and a technology leap to an ageing conventional submarine fleet. Project 75I envisages the acquisition of six additional conventional diesel-electric attack submarines for which Naval Group is a contender. The modernization of the Indian Navy, underway or planned, also includes: Project-28A (8 guided missile corvettes in addition to the already built 4 anti-submarine warfare corvettes under Project-28); Project 15-B (4 stealth guided missile destroyers, an improved version of the 3 Kolkata-class in service); Project 17-A (7 stealth frigates). India and Russia have finalized contractual terms for the acquisition of 4 Admiral Grigorovich-class frigates (2 ships constructed at Yantar Shipyard in Kaliningrad and the remaining 2 at Goa Shipyard Limited), an upgraded variant of the 6 Talwar-class frigates that Russia built for the Indian Navy between 2003 and 2013. The Hindustan Shipyard Limited (HSL) is gearing up to undertake sea trials of India’s first missile tracking ship by October 2018. In August 2018, the Defense Acquisition Council (DAC) has given its approval for procurement of 111 Naval Utility Helicopters, the first project under the Strategic Partnership model envisaging indigenous manufacturing of major defense platforms by an Indian partner under technology transfer from a foreign original equipment manufacturer. The DAC also cleared the procurement of 24 Multi Role Helicopters for the Navy from the United States under a Government-to-Government deal. The firepower is provided notably by the supersonic BrahMos ballistic missile and the Israeli surface-to-air missile Barak 8. A naval variant of the indigenously-developed “Prithvi” missile, “Dhanush”, a surface-to-surface missile, is being test-fired. The air surveillance has been strengthened with the acquisition of 8 Boeing P-8 Poseidon maritime patrol aircraft (8 might be added) replacing the old fleet of Tupolev Tu-142M and Ilyushin Il-38. A request for proposal is likely to be soon issued for the procurement of 57 multi-role fighter jets for the INS Vikrant for which Dassault Aviation is expected to bid with the Rafale Marine. Under the Navy's 'Mission Based Deployment,' a fleet of 50 of its combat-ready warships is deployed in the IOR to carry out round-the-clock surveillance from the Persian Gulf to Malacca Strait. The Communications Compatibility and Security Agreement (COMCASA) which India concluded with the U.S. at the 2+2 dialogue in September 2018 is intended to fully exploit the capability of the military platforms procured from the United States with access to the secure communication system network of the U.S. Navy and, consequently, get a better picture of the movements of foreign navies in the IOR. A constituent element of this monitoring is the Andaman and Nicobar Command, headquartered in Port Blair since its creation in 2001, the only tri-service theater command of the Indian armed forces with a location next to the Malacca Straits. The Navy has positioned about 19 warships in the area and has built two floating docks to repair and refurbish warships. Fighter jets and other combat platforms could be permanently stationed on the air bases in Car Nicobar and Campbell Bay where the IAF has currently only one Mi17V5 helicopter unit and two Dornier aircraft. The U.S. State Department has recently cleared the sale of 22 MQ-9B drones which India may deploy in the Andaman & Nicobar island chain. Admiral Arun Prakash (Retd.) who served as the Chief of the Naval Staff (2004-2006), once expressed the deep concern of the Indian strategic community in the face of an increasing Chinese power assertion in and around South Asia.A strategic encirclement, The Indian Express, April 25, 2017. The current Chief of the Naval Staff, Sunil Lanba, reported a noticeable increase in the deployment of Chinese submarines and vessels in the IOR, riding the wave of the Belt and Road infrastructure enabling naval access. In the northern part of the subcontinent, the militarization of the Tibetan plateau with the improvement of high altitude airfields supporting PLA Air Force operations and the modernization of road and rail networks, in particular with the extension of the Qinghai-Tibet railway link right up to the frontier with Nepal, revives fears of intrusions along the disputed shared Himalayan border. After the tensions over the Dokhlam plateau adjoining Bhutan in the summer of 2017, New Delhi wants to acquire a remotely piloted aircraft system that can operate at an altitude of more than 5,500 meters above sea level to monitor the Arunachal Pradesh border with China. On the eastern flank, Beijing will gain access to the Bay of Bengal through a multimodal link passing through Myanmar and ending at the deepwater port of Kyaukpyu built by the Chinese near an oil and gas terminal connected with Yunnan. On the western flank, the China-Pakistan economic corridor (CPEC) is connecting the province of Xinjiang to the ports of Karachi and Gwadar, the latter already managed by a Chinese company. The corridor passes through the northernmost province of Gilgit-Baltistan, officially claimed by India as being part of the old kingdom of Jammu-&-Kashmir. Beijing has confirmed the sale to Pakistan of 4 diesel-electric Type 41 Yuan-class submarines and a technology transfer for the construction of four others at Karachi shipyard. In March 2017, the Bangladesh Navy has commissioned its first ever submarines: two Type 035G Ming-class. These two countries, along with Myanmar, are major customers of Chinese military equipment. To the South of the Indian peninsula, China has already spent in Sri Lanka almost $2 billion in Hambantota to set up a port close to the busy East-West shipping route and to build a new airport. If as of today the new port remains commercially unviable, it has a potential strategic value although Colombo has reportedly promised India that it will not allow the port to be used for military purposes. Furthermore, caught in a debt trap due to its inability to repay Chinese loans, the Sri Lankan government has been left with no other option than to hand over the port and 15,000 acres of land around it for 99 years. China Harbor Engineering Company is also undertaking reclamation of land in Colombo to make way for a new Port City. In 2014, a Chinese submarine docked in Colombo for the first time. If President Sirisena is more inclined than his predecessor, Mahinda Rajapaksa, to take into account India’s sensitivity in security matters, China’s offer of assistance is very hard to refuse for any country facing a resource crunch. The same attraction for Chinese funding, with related security challenges, goes for the Maldives, an archipelago strategically located between India’s Lakshadsweep islands and the U.S. military base at Diego Garcia in the British Indian Ocean Territory. In December 2017, Beijing and Male signed a protocol to build a joint ocean observation station at the Makunudhoo atoll allowing the Chinese a vantage point of busy shipping lines, soon after the Maldives entered with China its first-ever bilateral free trade agreement. The defeat of the pro-Beijing Abdulla Yameen in the presidential election of September 2018 nevertheless offers India the opportunity of recovering some lost ground. Another island nation for which defense cooperation with China is moving ahead is Seychelles since the signing of a memorandum of understanding in 2004. Prime Minister Modi thought to have score a point over its Asian rival when, during a visit to Victoria in March 2015, the two parties signed an agreement for the development of a military facility in the Assumption Island. To enhance maritime surveillance, India’s planned investment included the renovation of an airstrip, upgrading a jetty and housing infrastructure for the Seychelles Coast Guard. 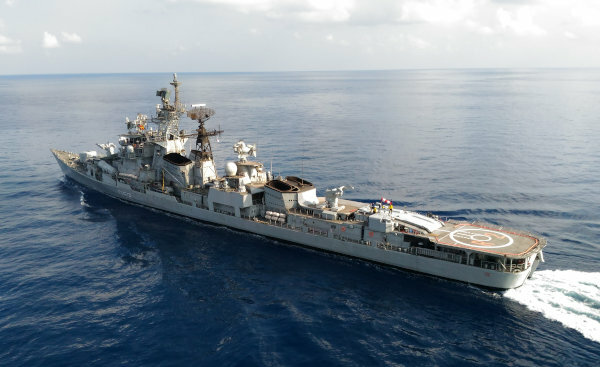 In return, India would use the naval installation, opens also to third parties provided they are not inimical to the “national interest of either party.” The project soon landed in controversy after the opposition in Seychelles accused the government of compromising sovereignty but seems to have been recently revived. Under the looming shadow of Chinese strategic rooting in the IOR, India strives to revitalize regional groupings. Long seen as just another talk shop, the fourth summit of the Bay of Bengal Initiative for Multi-Sectoral Technical and Economic Cooperation (BIMSTEC) has been held in Kathmandu in August 2018. Composed of five South Asian (India, Bangladesh, Bhutan, Nepal, Sri Lanka) and two Southeast Asian nations (Myanmar, Thailand), it was agreed on this occasion to bolster the institutional foundation and to establish a BIMSTEC Development Fund holding the promise of developing the connectivity between the member states. In the security domain, annual meetings of national security advisers have been launched and the first meeting of army chiefs took place in Pune (Maharashatra) in mid-September 2018 following the first joint military drill of member countries focused on counterterrorism. Thailand and Nepal have finally decided to send only observers. The latter was about to hold its second military exercises with the People’s Liberation Army at a time when Beijing’s influence is on the rise in Kathmandu. Also with the intention of offering some kind of alternative to China’s infrastructure diplomacy, India and Japan have committed themselves to support connectivity projects between North-East India and South-East Asia. New Delhi and Tokyo are also committed to pool human and financial resources in a proposed “Asia-Africa Growth Corridor”. Another avenue explored by New Delhi is the Indian Ocean Rim Association (IORA) bringing together 21 coastal states bordering the Indian Ocean around socio-economic development and maritime safety. France is a dialogue partner in the IORA. Born out of the will to reinvigorate the moribund Indian Ocean Rim for Regional Cooperation, the first Leaders’ Summit of the twenty years old regional grouping was held in Jakarta in March 2017. Nevertheless, its relevance still remains low. More focused is the Indian Ocean Naval Symposium (IONS), whose inaugural seminar took place in India in 2008 with the purpose of discussing ways and means of strengthening maritime cooperation and the regional security architecture. As a member, France will hold the two year IONS chairmanship in 2020. The Indian Navy organizes since 1995 under the aegis of the Andaman and Nicobar Command the multilateral “Milan” naval exercises with navies from the IOR. Sixteen foreign navies participated in its most recent edition off Port Blair in March 2018. Aspiring to play the role of a net security provider in the Indian Ocean, the India Navy conducts also a series of joint exercises with major naval powers at the bilateral and multilateral level. Exercise Malabar begun in 1992 with the U.S. Navy and which include since 2015 the Japanese navy as a permanent participant exemplifies this practice. Most of those naval exercises have been held off the coast of India, including drills in the Bay of Bengal focusing on anti-submarine warfare, a determined shift from the time when India supported UNGA resolution 2832 (1971) declaring the Indian Ocean a zone of peace and called upon Great Powers to refrain from expanding their military presence in the Indian Ocean. Admiral Scott Swift, former U.S. Pacific Fleet commander (2015-2018), while in New Delhi in May 2017, acknowledging India’s role in the stability of the Indian Ocean, recalled that New Delhi abided by the UNCLOS ruling to settle the maritime boundary with Bangladesh, despite losing some territory, a reference to China’s irredentism in the South China Sea. Another maritime bilateral cooperation gaining momentum is with France. During President Macron’s visit to India in March 2018, twenty years after the launch of the Indo-French strategic partnership (the first ever signed by India), was adopted a joint strategic vision of India-France cooperation in the IOR, reflecting a joint commitment to maintain the safety of international sea lanes for unimpeded commerce and communications in accordance with the international law. This is a far cry from the days when French presence in the region (Reunion and Mayotte) was considered nothing more than the manifestation of an outdated colonialism. A reciprocal agreement now grants French naval vessels access to Indian ports for repair and resupply, and Indian vessels the right to use France’s Indian Ocean military bases. It makes strategic sense for India who wants to develop its presence in the western Indian Ocean region, as witnessed by the access given to Indian warships to the strategically located base of Duqm on Oman’s southern coast and the conclusion of a bilateral maritime security agreement with Mauritius in 2017. Seen together with the provision of reciprocal exchange and protection of classified information and the co-development of a maritime surveillance satellite system to strengthen maritime domain awareness in the IOR, the agreement offers the basis to supplement the Varuna naval exercises held annually since 2001. The Mission Jeanne d’Arc, aimed at completing the training of officer cadets, makes regular port of call in India, an opportunity for holding passage exercises. India and France have already held two high-level bilateral dialogues on maritime security in the Indian Ocean which might in the future be extended to Australia. As the Indian Ocean is increasingly becoming an area of contestation with China, New Delhi is looking at ways and means of exploiting the insecurities that China’s sharpening ambition to become the predominant power in the Indo-Pacific area, extending from the eastern shores of Africa to the western Pacific, might generate. The Indian Prime Minister, Narendra Modi, announced in 2014 an “Act East” policy with the intention to boost the “Look East” policy initiated in 1992 whose achievements were seen as far too meager to compete with Chinese goals. If the need to engage all stakeholders is crucial, the ASEAN counterparts have a special place as more than half of India’s global trade is done with area countries or transit through the Malacca straits and the South China Sea. During the last Shangri-La dialogue, M. Modi underlined that Southeast Asia is the geographic core of the Indo-Pacific and ASEAN must remain central to the construction of any security architecture. Also India will work with the member states to promote a rules-based order and to ensure freedom of navigation apart from humanitarian assistance and disaster relief. Annual summit-level meetings with ASEAN leaders since 2002 evolved ten years later in a strategic partnership and a participation to the Expanded ASEAN Maritime Forum besides the enlarged ASEAN Defense Ministers meetings (ADMM-plus) established in 2010. At the bilateral level, India has strategic partnerships with Indonesia (2005), Vietnam (2007), Malaysia (2010) and Singapore (2015). The defense co-operations with ASEAN countries individually take different forms such as ministerial discussions, chiefs of staff meetings, naval exercises and coordinated patrols (Indonesia, Singapore, Thailand). Operational interactions are the order of the day. Singapore, with whom India has the longest un-interrupted naval exercise (SIMBEX), starting in 1993, gave in 2017 Indian naval ships extended access to its port facilities. New Delhi has been assiduously building military ties with Vietnam, inking a “joint vision statement on defense for 2015-2020”, elevating the “strategic partnership” to “comprehensive strategic partnership”, giving a defense line of credit for the supply of patrol boats, as well as proposing the BrahMos supersonic cruise missiles as well as the Akash surface-to-air missile defense systems. Apart from regular port calls by warships and tutoring Vietnamese sailors on operating Kilo-class submarines, the Indian Navy and the Vietnam People’s Navy held their first ever joint naval exercise in May 2018 in the South China Sea. The same month saw the visit of the Indian Prime Minister to Indonesia during which was unveiled a shared vision of India-Indonesia Maritime Cooperation in the Indo-Pacific. India will in particular contribute to the development of port infrastructure at Sabang on the northern tip of Sumatra overlooking the western entrance to the Strait of Malacca, gaining by the same access to it for operational turnaround. India entertains also strategic partnerships with Japan (2006) Australia (2009) and South Korea (2010).A strategic partnership has also been signed with China in 2005. India has proposed that the Indo-Pacific be discussed at the soon-to-be-convened second China-India maritime dialogue. The first one was held in March 2016, but the Doklam crisisin 2017 derailed this initiative. The strategic dialogue and defense cooperation with Japan has significantly matured. Above and beyond the bilateral exercises (the maiden JIMEX was conducted off Japan in January 2012) and multilateral interaction (Exercise Malabar and a trilateral dialogue including the United States first held in 2015), the two countries are expected to sign a logistics sharing agreement during the next annual summit, allowing the two navies to work together with greater interoperability. Military exchanges between Australia and India have intensified in the past two years despite India having so far refused to conclude a logistics support agreement with Australia to use each other’s naval facilities, a proposal that the Australian government put forward in 2015. In June 2017, the two nations held the second biennial AUSINDEX naval drills off the Western Australian coast. Whatever the intensity and the frequency of established contacts with Japan or South-East Asian countries, they only become meaningful as a containment strategy vis-à-vis China if they are in sync with the U.S. policy in the region. So far Washington has welcomed those interactions based on mistrust of Chinese intentions. The United States and India have set the framework for cooperation in the Indo-Pacific during Obama’s visit to India in January 2015 with a joint strategic vision for the Asia-Pacific and the Indian Ocean affirming the importance of safeguarding maritime security and ensuring freedom of navigation and over flight throughout the region, especially in the South China Sea.The United States Pacific Command (USPACOM) based in Hawaii has been renamed the U.S. Indo-Pacific Command (USINDOPACOM)on May 30, 2018. In June 2015, New Delhi and the United States renewed a ten-year defense framework agreement envisaging joint development and manufacture of defense equipment and technology and expressing the resolve to expand military capacities to secure the sea lanes of communication. On this occasion, Ashton Carter became the first U.S. Defense secretary to visit an Indian operational military command - the Eastern Naval Command in Visakhapatnam. The U.S. Administration has been pushing for a broader role played by India in the Indo-Pacific region. In June 2018, the 22nd edition of Exercise Malabar took place for the first time in U.S. territory, off the coast of Guam. Few weeks before, during the third round of the India-U.S. Maritime Security Dialogue held in Goa, the two sides exchanged views on ways to further strengthen bilateral maritime security cooperation. The second official meeting in less than a year of the Quad - the forum for consultation between India, United States, Japan and Australia to maintain an open Indo-Pacific relaunched in November 2017– occurred soon after.The Quadrilateral Security Dialogue was initiated in 2007 by Prime Minister Shinzo Abe of Japan leading to the four countries participating that year in Exercise Malabar. It was then a one-time affair following the withdrawal of Australia after Prime Minister Kevin Rudd decided to assuage China’s ill feelings. Still India opposed an Australian request to join maritime exercises along with the U.S. and Japan, and Navy Chief Admiral Sunil Lanba conveyed that there was no plan to “militarize” the Quad, seemingly indicating India’s reluctance to provoke China.“India, US, Japan all set for Malabar exercise with China in the crosshairs”, Times of India, 27 mai 2018. It is apparent that India wishes not just to ascertain its presence in the Indian Ocean Region, but also to expand its influence in the Indo-Pacific as a responsible stakeholder in the stability and safety of the region for the sake of protecting growing economic interests, doing its part in the balance of power to forestall any hegemonic position, and thus works towards being one counterpoint to China’s expanding geographical reach. The major challenge for New Delhi is to put into practice these intentions, implementation being always a major challenge compounded by the hard to find adequacy between strategic aims and budget resources ensuring sufficient force projection. It is a work in progress as many naval co-operations and forums for discussion with littoral states have been established only fairly recently. The debate remains open among the Indian strategic community and policy makers about how far the nation can go in its partnership with the United States without denting its strategic autonomy and antagonizing third parties.